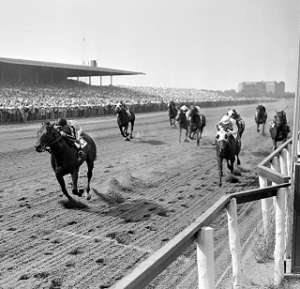 Queens has been a major center of thoroughbred horse racing since 1667 when King Charles II of England established here the first race course in his North American Possessions. This exhibition details the history of this amazing sport in Queens from those early days 350 years ago to the present and its concomitant cultural, social and economic dimensions and impact. It relates stories of the sport’s legends–horses, jockeys, trainers, and iconic races. The exhibition is co-located at Flushing Town Hall’s Greenroom and the Queens Historical Society. 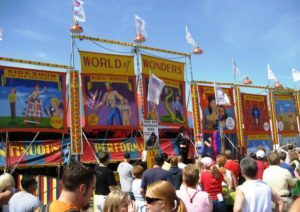 This family-fun event features midway games and rides for all ages, favorite fair food and World of Wonders old-time sideshow acts under the big top, from sword swallowers and fire eaters to escape artists and other exciting acts. Fair hours are 4 to 11 pm Monday – Friday and noon to 11 pm Saturday – Sunday in the event field adjacent to NYSCI, at the west entrance to Flushing Meadows Corona Park. On May 12 and 19, the fair will coincide with the Queens International Night Market held Saturday nights in the park. Come out and enjoy an evening of drinks and food with new friends, neighbors, and Queens-based food bloggers, QueensEats. It will be a great place to meet new people, engage with your community, and learn about QueensEats and Queens food. General Admission Ticket includes: One drink, passed hor d’oeuvres, and entry to raffle. Drinks will also be available for purchase. Designated Driver Admission Ticket includes: Unlimited soft drinks, passed hor d’oeuvres, and entry to raffle. A “Made in Queens Basket” from local vendors including Queens Knits, Suda, Emily Makes, Caustic Cross Stitch and more! All your dating tips come from Blanche. You wish you had comebacks like Dorothy. That means one thing. 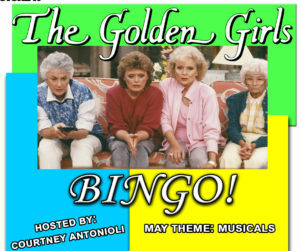 You should be at Golden Girls Bingo, one of Time Out NY’s 20 things to do in the NYC! Drop the cheesecake, put on your best 80s outfit and fan gear, adjust those shoulder pads and come play bingo! You’ll watch 3 classic episodes, play a special Golden Girls-themed game, win Dorothy’s moist cupcakes, and make new friends. 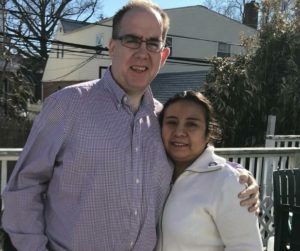 Bayside, Queens – Archbishop Molloy High School Class of 1988 alumni Chris Donovan, Lareto Evangelista, Charles Rabus, James Sheldon and Thomas Tzimorotas, will host a cocktail party at the popular Cajun restaurant Bourbon Street on Friday, May 11, 7 pm – 11 pm, to benefit their friend and classmate, Dennis Sheehan who suffered a stroke. Chris Donovan is the co-host of our It’s in Queens podcasts. France, Switzerland. Dir. Maryam Goormaghtigh. 2017, 80 mins. Digital projection. In French/Persian with English subtitles. Channeling the lo-fi deadpan of Jim Jarmusch, this winningly offbeat quasi-documentary follows three thirty-something Iranian friends on a road trip through the South of France. Immigrants who enjoy the freedoms of their adopted country while remaining nostalgic for their home, the trio camp out under the stars, knock back beers, hang out with a rock group girl duo, and all the while grapple with the question that hangs over everything: will they stay in France for the long haul or return eventually to Iran? Combining a minimalist formal precision with a knack for capturing the improvisatory interplay between her subjects, director Maryam Goormaghtigh produces an amiably loose-limbed, witty look at life in cultural limbo. The film is part of Young French Cinema, a program made possible with the support of Unifrance and the Cultural Services of the French Embassy. This film is part of MoMI’s Panorama Europe Film Festival. The guest coach is Marko Blazevski, who has represented Macedonia at both the 2012 Summer Olympic Games in London and in the 2016 Olympic Games in Rio. In 2012 London Summer Olympics, he presented with the honor of being Macedonia flag bearer during the Opening Ceremony. He has participated in 6 consecutive World Aquatics Championships (2011-2016). Another guest appearance will be Vera Blazevska, who was an assistant coach for the William Paterson men’s and women’s swimming teams during the 2017-18 campaign. She is a school record holder in the 50, 100 and 200 breaststroke as well as in the 100, 200 and 400IM in 2017 New Jersey Athletic Conference (NJAC) Women’s Swimmer of the Year. Marko and Vera will be supported by Swim Strong’s elite coaching staff of Vivi Dong and Ying Shen, nationally ranked from China. This is for swimmers ages 8-16 with 2+ years of competition. Participation is limited so register ASAP. 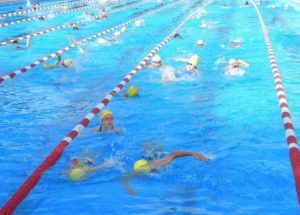 Swim Strong Foundation presents 6th Annual Water Safety Awareness Week Celebration. 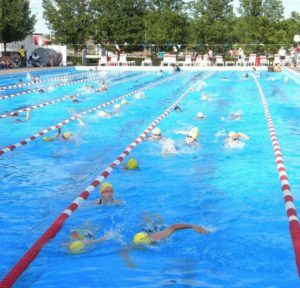 Families will get a jump on summer with a FREE week of safety and fun and a swim class. There will be CPR training, water safety workshops, and an opportunity to meet 2X Olympian Marko Blazevski and Patterson College Swim Coach Vera Blazevska. Note: Participants must be at least 8 years old and 55 inches tall to stand independently in the water. Join the Friends of Maple Grove Cemetery for a free reading of “The New Colossus” by Emma Lazarus (1883) – on display at the Statue of Liberty and an Anonymous Poem on immigration, followed by a discussion about the readings. This is a community conversation sponsored by Humanities NY and moderated by Jo-Anne Raskin, lecturer, tour guide and board member of the Friends of Maple Grove Cemetery. Light refreshments. Free parking on cemetery grounds – enter the gate at Kew Gardens Rd. & Lefferts Blvd. Join the Friends of Maple Grove for the second in a series of monthly walking tours in the historic Victorian sections of Maple Grove. 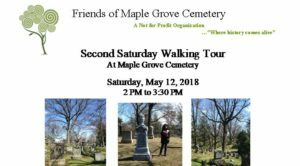 Jo-Anne Raskin, Friends of Maple Grove Board Member, Lecturer and Tour Guide will take you back in time to visit the gravesites of many historic, notable and interesting residents and tell their stories. Learn about many Victorian funerary symbols and styles. Expect light refreshments and free parking on cemetery grounds. Save $5 if you are a FMG member ($10).